One of my great loves in life…pancakes! Unfortunately, when I eat “traditional” type pancakes made with flour, they don’t sit too well with me. I feel so bloated and full, even just after a few. So I wanted to find a gluten-free pancake alternative. I had tried making them with different gluten free flours + xanthan gum…but I didn’t like the texture at all. Lucky for me, I have awesome friends. I was lamenting about my pancakes woes to Tara, and she clued me in to the recipe that she uses. We made it this morning for our pancake feed at the NuRVers Rally and they were AMAZING. These aren’t just “oh well, they will have to do”. They are “oh wow!”. 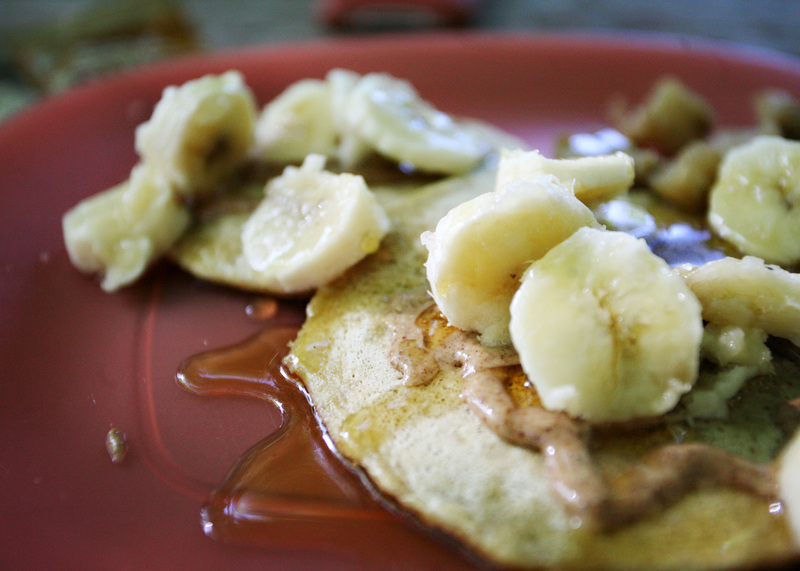 They taste like a bowl of yummy oatmeal, but in a pancake. I love to top mine with more yumminess. Today I enjoyed maple almond butter (I love these little squeeze pouches for when I go to restaurants or out on the town for the day), bananas, and pure maple syrup. That combination is like heaven to me. Ok, enough about me. Let’s get to the recipe! -Soak oats for 12-24 hours in the milk (store in fridge overnight). -Mix everything else into that. -Make pancakes and be happy. Tara also said that her friend uses them as “sandwich bread” for PB & J and such. They are yummy and hearty and would perfect for that. I thought that was a great idea! And now I have a question for you: What are your favorite pancake toppings? We stayed at a hotel with my parents recently…and I knew the only thing I would want to eat at their restaurant would be fruit. So I kicked it up a notch and brought a little baggie of chia with me. 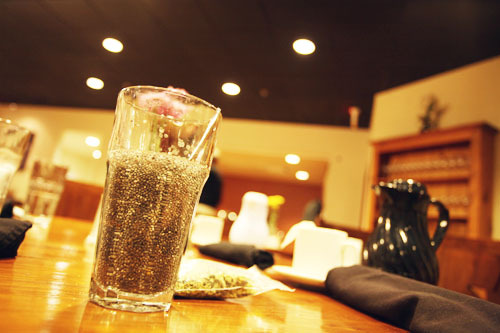 I asked the waiter for a glass of water without ice, dumped in the chia seeds , stirred and waited. In about 10 minutes, I had a nutritious breakfast packed with vitamins and goodness. I dumped it into a bowl, added some fruit and honey to the top and I was a happy girl!! 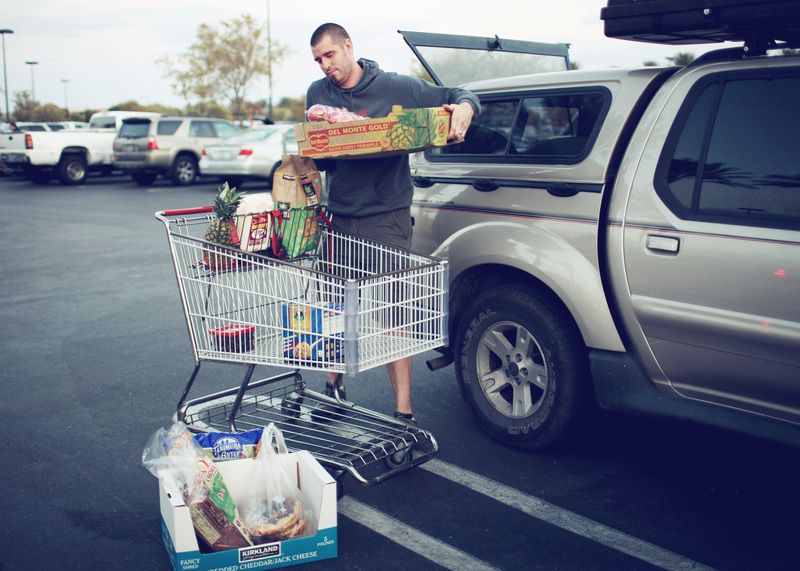 Don’t get discouraged when you’re traveling…CARRY CHIA! *That little baggie behind my chia is my baggie of tea…a girl has GOT to have good tea on the road! Yum. Amazon is the best place I’ve found to buy chia. 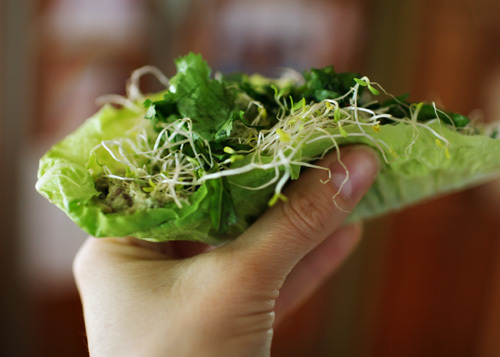 It’s from Raw Food World, but shipped through Amazon. If you have a Prime account, it’s free to ship. This is CHEAP!! I’ve seen it in the grocery store for $18/lb. This is TWO lbs. for $10.95.